district with its ochre adobe buildings as a World Heritage of Humanity Site.The stucco decoration and the painted cedar ceilings in two magnificent rooms are particularly noteworthy. 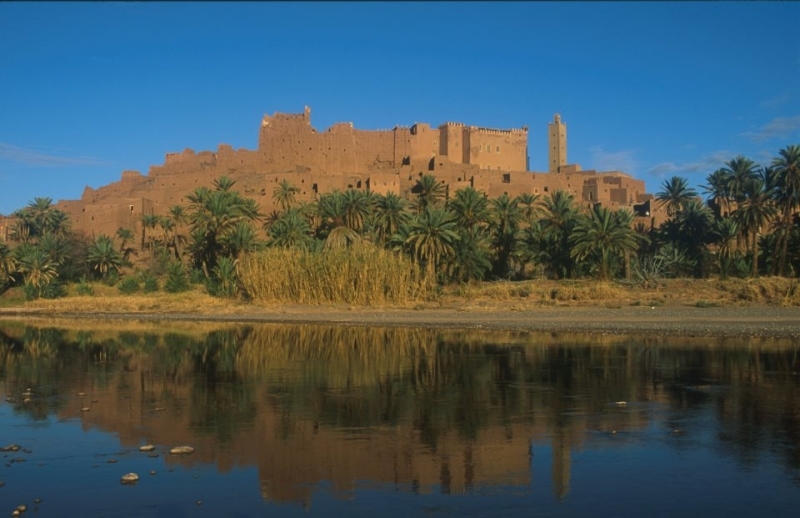 Ouarzazate has been unfailingly linked with cinema since 1984. Its climate, geographical situation and economic conditions have encouraged film studios to locate there. The sets of films such as Lawrence of Arabia and Asterix & Obelix: Mission Cleopatra or the Sheltering Sky and Gladiator can be visited. 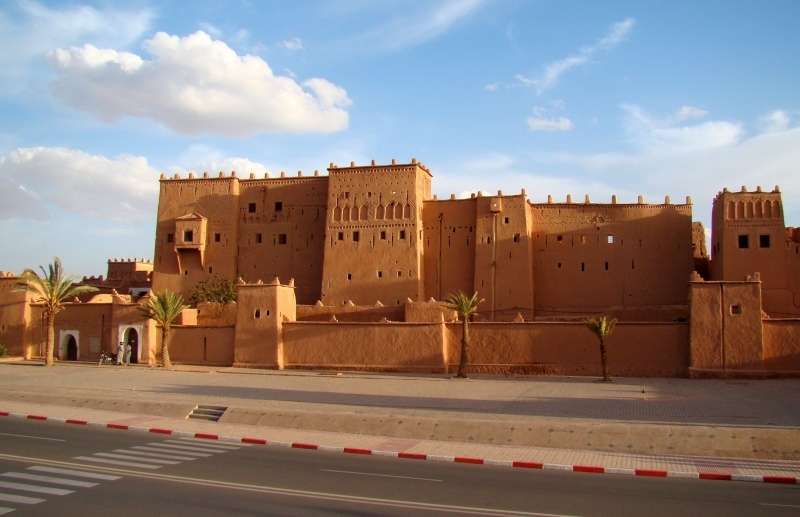 You can't leave Ouarzazate without visiting the Tiffoultoute kasbah and the Ait Benhaddou ksar. These remarkable examples of traditional architecture give a foretaste of the famous Route of the 1000 kasbahs. The view from the impressive ksar (fort, plural ksour), which has been recognized by Unesco as a World Heritage Humanity Site, is a magnificent panorama of the palm grove, the reg (stony desert) and the Atlas mountains. No matter which road you take from Ouarzazate, you will come upon marvels of Southern Morocco. Enjoy the adventure and meet the unspoiled people and their culture. The Dadès Valley runs from Ouarzazate to Boumaine. It is dry and lined with kasbahs and unique fortified villages. From time to time, you must leave the road and discover traditional Berber adobe houses. Take a cool break at the Skoura palm grove. After leaving Tinghir you arrive at the magnificent Todra Gorge. It narrows as its faces tower higher and higher (up to 300m) above your head. A trail, passing through the Dadès Gorge, leads to Boumalne. Depending on the lighting the rocks seem to be red, pink or mauve. The Sahro djebel (mountain) is situated south of Boumalne where one can observe some of the 150 varieties of birds already spotted in the Valley of the Birds. By continuing your trip along the Dadès, you pass through the rose country, El Kelaât M'Gouna, where rose water, so vital for complexions, is made. In May, the rose has the place of honour in a three-day festival held throughout the area. Further on, the Dadès Gorge opens up and then the Todra Gorge whose cliffs can be 300m high. The Drâa Valley extending for almost 200km towards the South irrigates a narrow oasis where dates and henna grow. The Tissergate ksar (fort), one of the ksour (forts) which line the valley, houses a museum of arts and traditions in which many everyday articles and Berber craftwork are exhibited. M'Hamid is the starting point for trips into the Sahara. Two high dunes in Tinfou give a foretaste of the desert. For the real thing continue west from Tinfou to the Chigaga dunes which extend for 150km. One of which can reach a height of 150m. 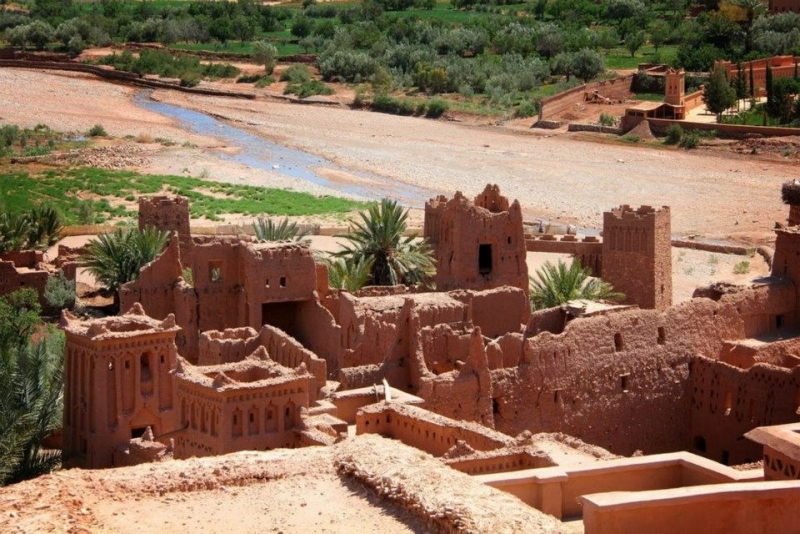 - Check our day tour to amazing Ouarzazate and Ait ben haddou from Marrakech.